3M Safety Walk Anti Slip Tapes We supply the full range of the fantastic 3M Safety Walk brand of Anti Slip / Anti Skid Grip Tapes. Please give us a call for current prices on 01268 768 768 and we will try our utmost to make you a saving! 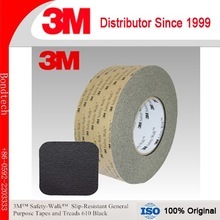 3M Safety Walk Anti Slip Tape is a industry leading range of Non Slip Tapes available in many types including General Purpose, Course, and Conformable.